Posted on March 3, 2018 March 3, 2018 by Marty Schoenleber, Jr.
Three years ago, I was preaching in Watseka, IL at Trinity Church. They have had some flooding there this year and I would like to ask you to pray for them as they recover and care for their neighbors. We were working through the gospel of Luke and had arrived at chapter 15. This was the summary of where we had been and the challenge I gave as we wrestled with the text together. “The Pharisees and Scribes are the targets for the parable (vss. 1-3). Who were they? One way of thinking of them is that they were the most Bible literate, Bible-quoting, Bible doing, Bible-honoring, people of the first century. Who would fit that description today? Wouldn’t it be we evangelicals? This morning I preached the third message from Luke 15. 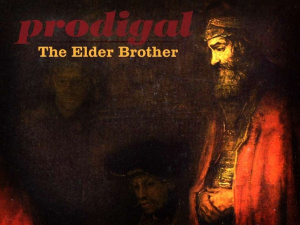 The so-called “Parable of the Prodigal Son” is perhaps the best know and the worst titled parable of all of Jesus’ masterpieces. Some have called it the greatest short story ever told. Jesus is hunting hearts. Unfortunately, both the naming of the parable and the predominant focus when it is taught leads us away from the point that Jesus was primarily aiming at.